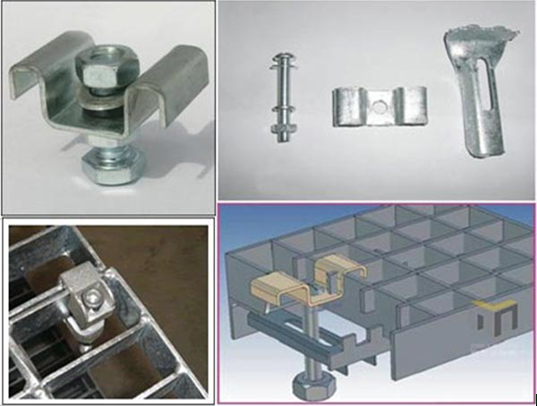 Product categories of Steel Grating Mounting Clip, we are specialized manufacturers from China, Steel Grating Mounting Clip, Stainless Steel Mounting Clip suppliers/factory, wholesale high-quality products of Galvanized Mounting Clip R & D and manufacturing, we have the perfect after-sales service and technical support. Look forward to your cooperation! Steel Grating plate is made of high quality steel plate after bending machine, made after punching, sturdy and durable, easy to install, galvanized after the installation of a beautiful folder, and not rust, can be a good fixed installation folder. The installation of the steel grating can be fixed by welding and mounting fixture fixed in two ways. Welding fixed for permanent removal of the site, such as the equipment around the platform, and the use of the installation folder does not damage the zinc layer and easy to remove the characteristics. The mounting clip is suitable for all kinds of steel gratings, which consist of upper card, lower card and M8 bolt. Welding fixed method is: in the steel grating each corner of the first flat steel, the weld length of not less than 20mm, high not less than 3mm of the fillet weld.